A new installment in the bestselling series of action games. The game expands the ideas introduced in the third entry in the franchise, released in 2001. Grand Theft Auto: Vice City is another installment of the very popular series of games that tell the story of the criminal underworld. The game expands the ideas introduced in the previous entry in the serious – Grand Theft Auto 3. The game takes place in the eighties in a new metropolis called Vice City. Tommy Vercetti, the main protagonist of the game, is sent there by Sonny Forelli to “take care of” the local gangs, Cuban gangsters and corrupted cops. The game, similarly to its predecessors, consists of series of missions that combined together create one consistent and non-linear story. The player is tasked with car theft, robberies, murders, delivering valuable packages, planting bombs etc. – actions typical of a criminal. 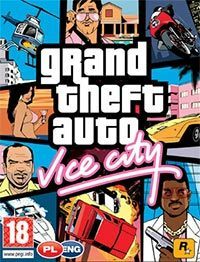 Vice City is a giant and varied metropolis (so-called gate to Southern America and the Caribbean). Here one can find sunny beaches, recreation facilities, crowded city center with skyscrapers, and slums. Various people can be also encountered on the cities of VC, from common Johns to famous politicians. The player can move through the city in various ways. Few dozen of vehicles can fall into the hands of the player, including some from GTA3 and some completely new – for example Chevrolet Corvette . What’s new is the possibility to use bikes, sport motorboats and helicopters. The player can also select from 30 different weapons, starting with a baseball bat and on sniper rifle and Uzi ending. The game features legendary soundtrack, played by radio stations that broadcast various music genres: rock, pop, techno, jazz and soul.